The most awaited series is back at creating buzz! Saif Ali Khan-Nawazuddin Siddiqui's Sacred Games series of Netflix India has kept the fans on the edge of the seats. The first season was a rage on the internet with fans mimicking dialogues and style of the key characters. In no time, the series got a massive fan base, easily making the hype of the second season be higher. Now, to the delight of the fans, Sacred Games 2 is returning in just 14 days, if we go by this latest post released by Netflix India! Kubbra Sait Opens Up On Kukoo Returning To Netflix Sacred Games Season 2!. The post asks the fans to take out the calendar and note down the date as something massive will happen in 14 days. 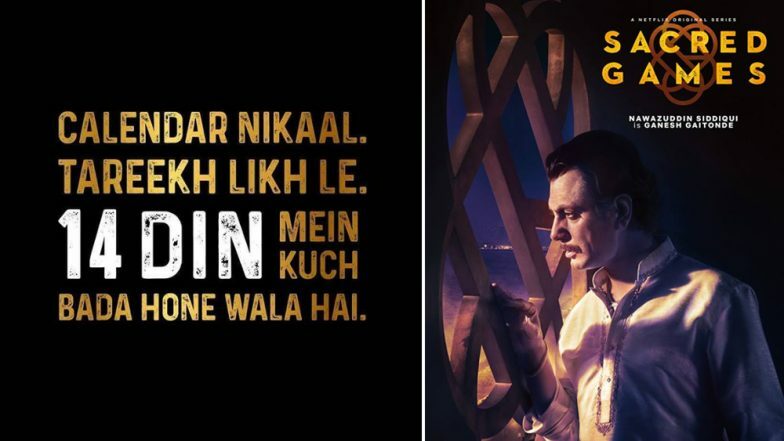 Now, even though there is no mention of Sacred Games 2 anywhere in the post, the style of the post and the language can be easily read in Ganesh Gaitonde's (Nawazuddin) voice! The caption reads, 'Is baar kya hoga Bhagwaan bhi nahin jaanta.' Well, enough of hint for the die-hard SG fans, no? Check out the post below and decide yourself. Just like everyone else, the fans on the Instagram were also quick to decide that this post was about the teaser of Sacred Games 2. Earlier, in an interview with a publication, Nawazuddin had said, "“This season will be the baap of the first one. Even if people know Ganesh Gaitonde, they won’t know what to expect from him. We shot extensively across Mombasa, Cape Town and Johannesburg." Now, it has to be seen whether the makers decided to release a poster or a video or simply another hint like this one! What are you expecting next?